I have been receiving emails and comments today about yet another PageRank downturn for multiple sites. Colleen’s Simple Kind of Life and 5xmom. The numbers seem to be stable across multiple data centers. There doesn’t seen to be any change in prominent Search Marketing sites such as Search Engine Round Table and Search Engine Journal, and other popular bloggers such as Emom and Yaro still seem to have their degraded but still “head above water” rankings. Meanwhile Matt Cutts is playing around with $200 PCs and the negative views of the blogosphere regarding Google. Google have had more than a month to change the description of PageRank on their website. I haven’t seen any change to Search Engine Rankings and there is still no way to request reconsideration without admitting guilt. The Webmaster Help Center also doesn’t give an option to report that you think Google is making a mistake in their manual evaluation. If your site has previously violated our webmaster guidelines, and you’ve made changes to it so that it now meets our guidelines, you can ask Google to reconsider your site for inclusion in the index. In addition, if you recently purchased a domain that you think may have violated our guidelines before you owned it, you can use the reconsideration request form to let us know that you recently acquired the site and that it now adheres to the guidelines. 1. 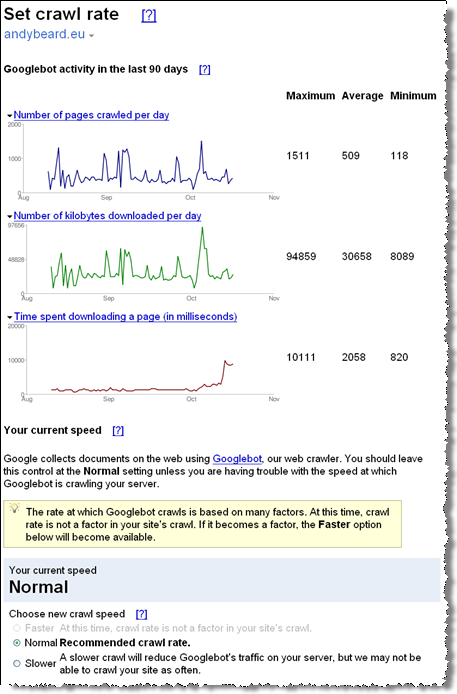 Sign in to Google webmaster tools. The webmaster tools Dashboard opens. 2. Under Tools, click Request reconsideration and follow the steps. 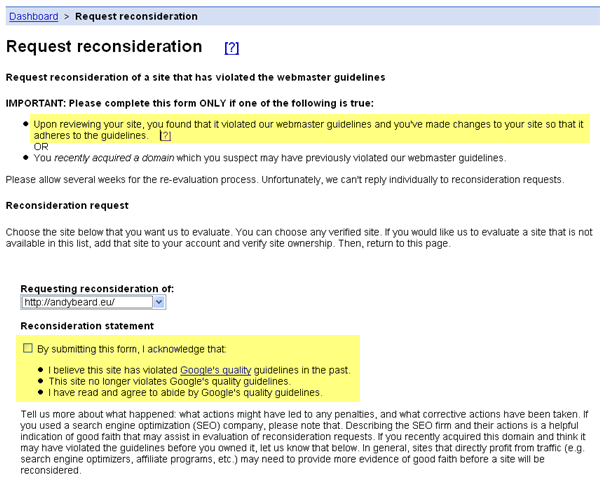 Google do now call this reconsideration, not just reinclusion, and Matt notes that you can still be in the index even though you have a penalty, which he updated November 4th 2007. I did find something cool though which I hadn’t seen before, maybe I missed it being reported, or didn’t pay much notice. I am still being crawled frequently and there are some interesting spikes. It is a pity that the graph doesn’t line up with the scale. From January people using PayPerPost will be able to use SocialSpark. SocialSpark Alpha screenshots do still have PageRank listed, and that will likely be removed totally unless Google change their stance. I still don’t sell PageRank, but traffic hasn’t changed, if anything it has increased as I write more content that people want to read and link to, and it even brings in some search traffic. Google is making huge mistakes with these updates. I know many people receiving penalties sell links, and I am not trying to defend them. When you get someone like regular reader Rob, a real expert in SEO, who based on the links he receives should be a comfortable PR4, or possibly a PR5, currently a PR0, because he wrote one paid review using nofollow on the links. Then you get affiliate marketers like Vlad who may have written a couple of high quality reviews, and sold some advertising. At the same time he also is an affiliate with some affiliate services which offer SEO friendly “clean links” for their merchants. For a website owner they are still links from which they will be making money, though the money from affiliate marketing is variable – the links still affect search engines, as do many other affiliate links which feature 301 redirects. Now whilst Aaron’s issues might be appeased as a result of the recent interchange with Matt, that is really just the tip of the iceberg. Aaron hasn’t been lynched. To finish I am just going to steal the words of Michael VanDeMar which he posted as a comment on Matt’s Reporting On Paid Links post. Honestly, Matt… and if your legal team won’t let you answer this, then I understand, but if you are allowed to answer then I (and I’m sure others) would really, really like to know… as the G algo stands now, exactly how much off balance would you say it is due to the insidious act of buying and selling text link ads? How many man hours have you spent combating this crime against humanity, and at what cost? And is it seriously skewing the results that much, that all the efforts spent on it were, and continue to be, justified? Is the algo that fragile? The other main reason that I disagree with this idea is that you think (or appear to be implying, anyways) that Paid Link === No Human Review. This not the case 9 times out of 10. You should know that. An official statement finally from Izea (PayPerPost) on their blog regarding Google PageRank Updates. We now know from some of our friends inside of Google (thanks “bob”) that they are now looking for phrases such as PPP, PayPerPost,ReviewMe, Payu2blog, etc. in the text of your post. For that reason I would suggest refraining from using any type of this text in the body of your posts, sponsored or not. When you disclose thank the sponsor, not PPP. I would like to thank Ted (CEO of Izea) for having the courage to say something about this in public, something it seems Google so far have not managed to do, and rarely do so on an official company blog. Lisa Stewart of Bigfoot Web Marketing also has an excellent writeup of the decision process on the PayPerPost boards that ultimately led to Ted Murphy making a statement.